I grew up in the States but most of my experience across a lot of staple "American" classic dishes- from country fried steaks to pot roasts to casseroles- were limited to such things as what I read in books, saw on TV, or by chance, came across some strange and pale imitation during lunchtime in my school's cafeteria. But the one place where I did experience such cuisine was at a chain of buffets some of my fellow Americans may recognize called Old Country Buffet (also known as Hometown Buffet, Country Buffet, Ryan's, etc, in other parts of the States). Buffets are already an exemplary reflection of the land of excess that is my home country but when it's American comfort cuisine that's being served it's enough to make your eyes boggle. Mountains of roasted meats of all kinds, pools of salad dressings, all manners of fried dishes topped with a wide variety of gravies, and whatnot and all for the low price of (back then) something like 6 bucks. In general, much of the world turns its nose up at this cuisine but for us Americans, there's a certain sense of nostalgic soul that's attached to it and I even find myself thinking about such food occasionally. When I heard of this restaurant called The Beastro billing itself as an American bistro, I dismissed it initially thinking someone was looking to capitalize on the foreign food trend here and serve weird hybrid dishes that only shared similarities in name with what they were trying to imitate. Lord knows how many of those dining experiences many of us have had while living in Korea. A few months back though, some dear friends shared they were having their joint birthday party at The Beastro and, despite my suspicions, I was blown away by them on so many levels. Here's a look at my experience there! Located in Hongdae, near the Hongdae Playground, it's easy to miss The Beastro as it's located on the second floor of a big building (above a MAC store). Unless you're walking by while looking above you probably would pass by without knowing. Hongdae get's some flack at times for being a cheap trend-centered dining area that capitalizes more on the current tastes and crazes among the younger Koreans. So I entered The Beastro ready to expect another fast dining stop with gimmicky dishes on the menu that catered more towards visuals over authenticity and tastes to satiate the current SNS photo uploading craze. Inside the restaurant, The Beastro occupies two spacious floors, has a full bar, plus a nice rooftop which is perfect for warmer seasons. The interior is a simple, but classy, black and white in the walls, lighting fixtures, and blinds. I had expected it to take a loud "Americana" theme with those ubiquitous vintage gas stop signs, graffiti, Uncle Sam posters and whatnot so many "American" cuisine restaurants around here try to exclaim in your face. Instead, The Beastro has an elegant yet homely feel that finely balances it between a fancy bistro and the cozy dining room of someone's home. On the second floor you can see the kitchen hard at work while the blinded windows into the kitchen adds to the home-like feel. It's versatile enough to be a great meetup spot with friends or a nice dinner out with a date. For the birthday party, our hosts had reserved the rooftop which has a great view of the neighborhood. There's a glass fence around the perimeter with lights every 100cm or so and there were (fake) candles) on every table for added lighting and ambiance. Kicking things off for the night was a celebratory drink for our birthday friends- a standard Old Fashioned... except I'm not sure that's what it was. I couldn't taste the bitters nor much of the whisky/brandy and it tasted more like juice with a touch of alcohol in it as evidenced by the yellow, opaque color and not the clear, orange-hued Old Fashioned I was accustomed to. Somewhat disappointing cocktail aside, the appetizers kicked off with some potato rolls (but more like bites) with garlic jam and also some crisp bread with salmon rillettes. The potato rolls and garlic jam didn't look like much I was actually planning to skip them as I knew there was a lot of food coming out that night but I'm glad I didn't. The mini rolls, despite looking quite hard on the outside gave way to a pillowy soft center which released just the slightest hint of earthy potato. The garlic jam had the right amount of balance between sweet and garlicky without one overpowering the other. Using the rolls as a vessel for the jam proved a worthy match and it was nice to see The Beastro was thinking outside the box beyond your standard rolls and butter. But the true star of the appetizer course, and one of the best dishes of the night, was the salmon rillettes. The flecks of cured salmon, chives, chopped olive bits, and everything in it came together spot on. A bit creamy, a little bit of tartness, sweetness, and with nothing going overboard. They could have cut corners by using low quality, fishy salmon and then drowning it in something like mayo but this was just top notch and so wonderful on the crisp baked bread. If they sold this salmon dip by the container I'm pretty sure I'd buy the stuff and just top it on crackers or fill it on sandwiches all day. Heck, I'd probably just spoon it out of the tub and eat it. Seriously, even if you're not a fish fan, try this one out. It's a home runner. When I saw the kale and ricotta cheese salad next on the table, I admit I was a bit apprehensive about it thinking it was more a novelty dish hitching on the Western trend of kale and the Korean fondness for cheese. But I have to say it came together quite well. Chopping the kale into ribbons provided a different texture from your usual leafy salad greens while the quartered cherry tomatoes and cucumber bits provided a solid base against the mellow cheese and tangy vinaigrette. I found the tiny diced chicken breasts a bit oddly minuscule in size comparison with the rest of the salad makeup but a small thought, nonetheless. The vinaigrette is on the tangy/savory side which was nice given the penchant most Korean restaurants have for overly sweet salad dressings. You can probably guess what the buffalo mac and cheese is and tastes like. Atop the bed of mac and cheese sits a few pieces of buffalo chicken with a drizzle of buffalo sauce on the parmesan breadcrumb crust. It sounds good on paper and it is on the first bite or two but I feel it's a case of where the sum of the parts just isn't greater than the whole. At some point it becomes all too much, too rich, too many flavors that are all boldly trying to make itself known on your taste buds. Separately, they're fine on their own- though I do wish the mac and cheese was more "cheesy" and the chicken just crisped up a little more for more texture. Nevertheless it got pretty heavy real quick and I think a bit more buffalo chicken to less mac and cheese might have helped the ratio out a bit more. The chimichurri fries was the sole major disappointment of the otherwise fine dinner as the chimichurri was just. too. damn. salty. Serious sodium overload and it didn't help that the chimichurri was a bit sharper than usual which muddled the flavors of the minced garlic and herbs. It was salty to the point that one of our birthday friends even brought it up to the attention of the server. The fries were a bit overdone too unfortunately. Despite these little bumps, the food more than rebounded beginning with the awesome southern fried chicken platter. It's not really a traditional southern fried chicken per se with its bagna cauda-honey combination on top but it is incredibly moist and flavorful. It does get a big soggy towards the end because of the sauce on top so make sure to eat quickly, but it shouldn't be too difficult putting away this dish! The real jewel on The Beastro's crown though is its 24 hour hanger steak. This is a dish that doesn't hide its beauty, nor does it need to. Despite having an ashy black sear crust, it practically blinds you with its perfection when it's brought on the table. We were all absolutely filled to the brim at this point but the steak's visual and scent had me reaching over almost immediately. The steak is impeccable in almost every way and that's because there's so much preparation that goes into it. As its name tells you, a slab of the prized hanger steak- a cut so prized that it was nicknamed "butchers cut" because butchers would keep it to themselves- is cooked sous vide for 24 hours. Yes, 24 freaking hours, before its given a pan sear in beef fat and butter. The result is a 1-2 punch combo in the flavor department as that sear with all that fatty, crusty goodness gives way to that mouthwatering, tender, and juicy meat inside. Those consecutive steps of sous vide then pan sear is what perfectly locks in all the moisture and flavor of the steak. The beef fat gravy at the bottom with the roasted vegetables is a wonderful gift that has been bestowed on you in addition to the marvelous steak but the star players they are not- steak, steak, and steak only is the undeniable star. And, despite it being the last dish brought out, not a bite was left as a testament to its magnificence. Seriously, if anything, just come here for this glorious steak. On the side, I had another cocktail in which I brazenly decided to be bold and go with the one that no one else wanted- the master cleanse. Described as being made of, "house made limoncello, cold brewed green tea, maple syrup, and spicy chili rim", it's The Beastro's take on that odd cleanse with maple syrup and lemon and chili peppers that people were into for a while. Eating adventurously in its advantage has the ability to open up new worlds in taste and cuisine when done right but unfortunately when it's not you're left lamenting your lost money- this was unfortunately the latter. In retrospect, I'm not sure why I chose a cocktail that models its flavors on a "cleanse". After all, have you ever heard anyone say they find cleanses delicious? The flavors of the cocktail ingredients all came out separately in no coherency and it was a bizarre yo-yoing of sweet, tart, spicy flavors that won no respect or fans from any of the people around me who tried my cocktail either. The other cocktails on the menu seemed rather unique and I could tell they put a lot of effort into them but both the Old Fashioned and the Master Cleanse were misses for me. So, there were a few mishaps and the cocktails seem like they could use some polishing but overall, the food and the effort behind them are phenomenal. I should also note that the staff and servers were very attentive and nice and our birthday hosts also mentioned that they were very accommodating and friendly. All in all, I'm already looking forward to my next visit! The Beastro goes to great lengths and effort to put a modern and often unique take on classic American comfort dishes. The result is food that has a luxurious but unpretentious aspect to it without sacrificing neither soul or essence. 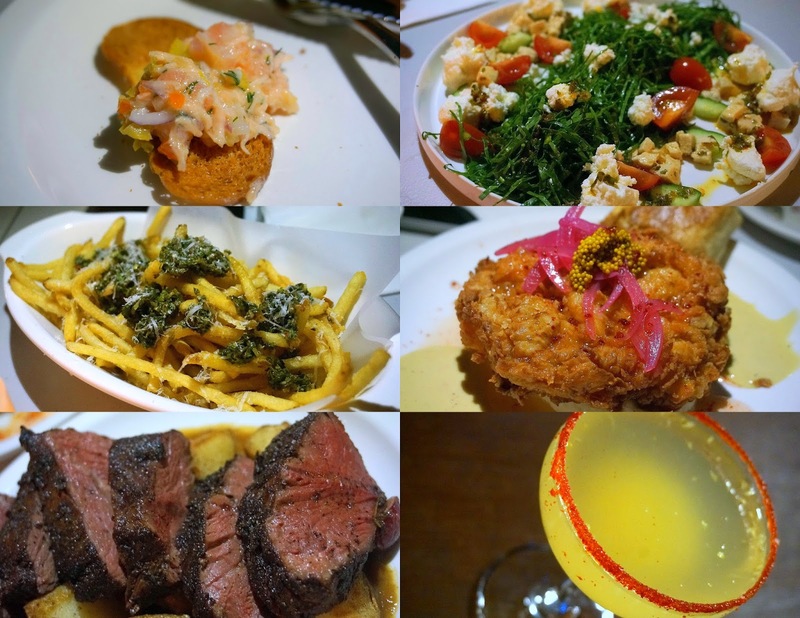 Standouts like the salmon rillettes, southern fried chicken platter, and 24 hour hanger steak are knockout hits with many of the seasonings and sauces house made which reflects an exquisite attention to detail. There are a few kinks in the details (such as some sodium control needed in dishes like the chimchurri fries) and their cocktails, while creative, don't quite match the level of their food overall. But overall, the food is fantastic, prices are decent for all the preparations that go into the dishes, and staff and servers are top notch. The Beastro easily beats any American classic restaurants in Itaewon or even any I've had in Seoul thus far. And to reiterate- that 24 hour hanger steak is a must! Come out exit 9 and walk straight for about 150 meters until you see the major road on your left heading up to Hongik University's front entrance. Walk up that major road until you get almost to the university entrance and cross the road to the other side and keep going for about 50 meters. The road will split on your right as it passes by the Hongdae Playground and just 20-30 meters up you'll see a MAC store on your right with The Beastro above it. 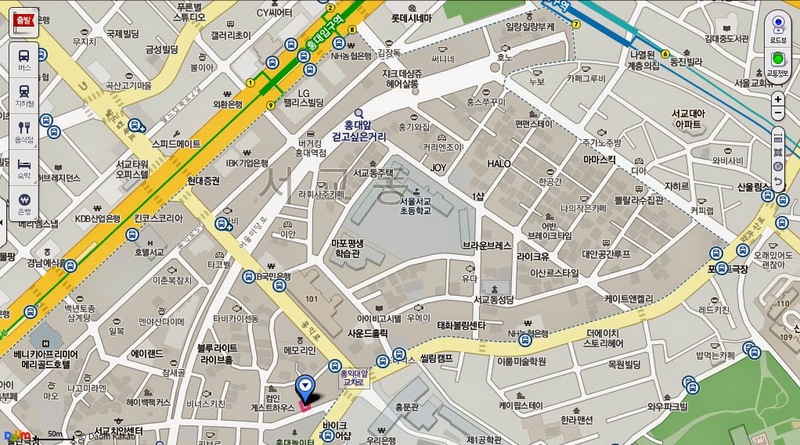 The restaurant is directly across from the Hongdae Playground and all the street stalls selling jewelry and such. Do check out the rooftop in warmer seasons and, if you have a large group or event taking place here, make reservations. They're very friendly and accommodating!